In Jerez for one of the best weekends of the year, the last weekend before Christmas. The town is beautifully lit, as always, but with new colourful decorations. 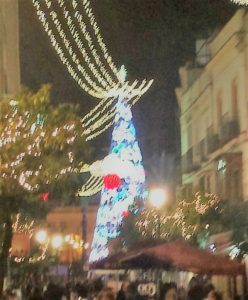 The traditional Andalucian carols which are usually played over the central sound system aren’t in evidence this time ( for reasons which will become obvious ) but there is, as always, a Christmas market in Plaza Arenal. 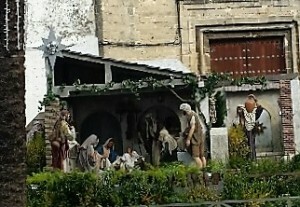 One feature of this market is the selling of pottery figures and artefacts ( some of them tiny ) for the making of nativity ‘Belen’ or Bethlehem scenes. There is always a life-size nativity scene outside the San Domingo monastery, but this year there is also a display within the cloisters of nativity ‘dioramas’, mostly modern, but some early twentieth century. These, incredibly detailed, scenes reminded me of the ‘Dutch interior’ paintings of the 17th century. Each has ‘perspectives’ through windows and doors into other rooms of the ‘stable’ or on to the outside. In one there was even a view of the sea ( I’m not sure Bethlehem was near water, but Jerez and its surrounding area definitely is ). 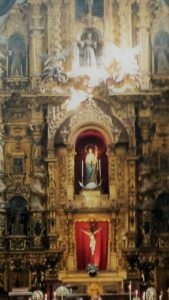 Many of the churches of Jerez also have nativities and leave their doors open on Sunday so that one can wander inside and look. There is a buzz of anticipation about the town as the holiday nears and the streets are busy until late in the evening with shoppers and the squares with drinkers and diners. It is still warm enough to be coat-less during the day and just wear a jacket at night. Were you to wander around the old centre, as we did, you would come across groups of people, carrying tambourines or pottery drums, often singing as they go from venue to venue. It’s zambomba time and this weekend is really the last opportunity before the holiday to play, dance and sing late into the night in the streets of the city. 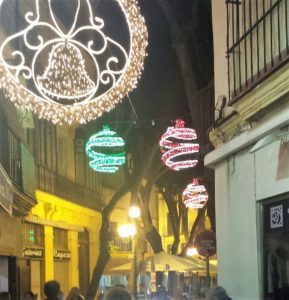 In the three days from Friday 16th to Sunday 18th December there were, according to the local newspaper, the Diario de Jerez, over one hundred zambomba gatherings around the city, many of them in the old centre. It is impossible to walk around, in the day or night, and not run into them. We have seen flamenco dancers and singers performing on the main shopping street and finely clad ‘medieval’ troubadours with guitars and lutes strolling the streets ( taking requests ). There have also been plenty of the more traditional gatherings in squares or side roads with crowds clustered around a fire and a group of seated musicians. These are the more local zambomba, where neighbours come together to sing, eat and drink, bringing out chairs from their houses or from local bars and cafes. In all cases the zambomba drums sound. Said drums can be purchased at a stall in the Christmas market. I didn’t buy a drum, but honey and candied almonds were purchased. The almonds won’t make it back to the UK, they were all scoffed during festivities at La Pandilla, where we joined in the fun and ate flaming chorizo and morcilla. I need the Christmas holiday now, just to have a rest. 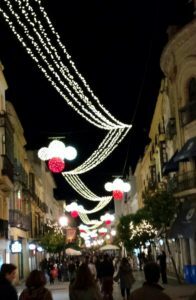 If you enjoyed reading this article you may also enjoy Cadiz in the Rain Vendimia December – Advent Andalucian Spring or any other of the articles to be found under the ‘Foreign Field’ tag.